VATICAN CITY (CNS) — Pope Francis offered his prayers to all of those affected by a deadly earthquake in Nepal, encouraged rescue and emergency workers in their efforts and sent an initial donation of $100,000. More than 4,300 people were known to have been killed and an estimated 1 million people were left homeless after a magnitude-7.8 earthquake hit a mountainous region near Kathmandu April 25. The devastation included not just buildings collapsing from the tremors, but also people and villages being buried by landslides and avalanches triggered by the quake and aftershocks. The number of casualties was expected to be much higher as rescue teams tried to make their way into more remote areas. “I pray for the victims, those wounded and for all those who suffer because of this calamity,” Pope Francis said after reciting the “Regina Coeli” prayer with visitors gathered in St. Peter’s Square April 26. The Pontifical Council Cor Unum, which promotes and coordinates charitable giving, announced April 28 that Pope Francis had sent “a first contribution of $100,000” to assist the victims. The money, it said, “which will be sent to the local church, will be used to support the assistance efforts underway on behalf of the displaced” and others impacted by the quake. The papal donation is meant to be “a first and immediate concrete expression” of the pope’s personal concern for all the quake’s victims, Cor Unum said, adding that bishops’ conference and Catholic charities from around the world already have taken an active role in helping survivors. 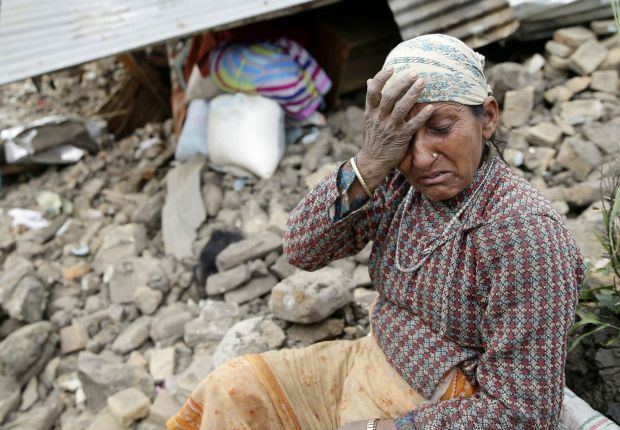 “Pope Francis was deeply saddened to learn of the earthquake” and the damage it caused, said a telegram sent April 25 by Cardinal Pietro Parolin, Vatican secretary of state, to Bishop Paul Simick, apostolic vicar of Nepal. The pope expressed his prayers and solidarity, and “he offers encouragement to the civil authorities and emergency personnel as they continue their rescue efforts and assistance to those touched by this tragedy,” the telegram said. Huge “tent cities” have sprung up in Kathmandu to shelter those whose homes have collapsed or been damaged and those who dare not return as strong aftershocks continue, Caritas Internationalis reported in press release April 27. “We hope to go back to our house soon, but are hesitating because of the aftershocks,” said Renuka Magdalene Thakuri, 54, who sought shelter with other families in Assumption Church in Kathmandu. Jesuit Father Pius Perumana, head of Caritas Nepal, said the Catholic charity has been supplying tarps, tents and food, and was trying to help protect people from the rain and cold. “People are still trapped in buildings and we don’t know whether they are dead or alive,” Father Perumana told Caritas Internationalis, the Vatican-based umbrella organization for more than 150 Catholic relief and development organizations around the world. It said Catholic Relief Services, the U.S. Caritas partner, was sending relief materials from north India and working with Caritas Nepal to procure additional relief materials locally and in India. “What the people need immediately is shelter. Temperatures are dropping at night and there is also rain. Children are sleeping outside at night. It is really traumatic for them,” Father Perumana said. Immediate shelter as well as water and sanitation were among the top priorities, Caritas Internationalis said. Santosh Kumar Magar, 29, said he was attending the ordination of a new priest in Okhaldhunga, a remote part of eastern Nepal, when the earthquake hit. “I came out of the room, and saw two, three houses falling down around me. Some of the animals died around the same time. The people were saved because all the villagers were gathered for the ordination,” he told Caritas. “We came to the church because we know a lot of people here so we can be together and coordinate and help each other out. Now later I feel everything is going to be all right,” he told Caritas.